Making gluten free Christmas cookies can be a challenge especially when you are using only GAPS allowed ingredients. Chocolate is not allowed on the GAPS diet but we do eat chocolate on occasion sweetened at home with honey. These recipes were adapted from the low carb gluten free dessert guru: All Day I Dream About Food and tested in the Industrious Family Kitchen. Preheat oven to 325 °F and line several large baking sheets with parchment paper. In a large bowl, beat butter with honey until light and fluffy, about 2 minutes. Beat in egg, orange zest and vanilla. Beat in almond flour mixture until dough comes together. Roll cookies into balls and place them on cookie sheets. Bake cookies 12 to 14 minutes, or until set but not browning much around the edges. They will be quite soft still. In a double boiler, in a glass bowl melt the chocolate and honey until smooth. Let cookies cool at least 15 minutes before dipping them. Add cookies, one at a time, face up into the melted chocolate so bottom or side is coated. Remove with a fork and place on wax paper lined plate. Preheat the oven to 325°F and line two rimmed baking sheets with parchment paper. In a large bowl, beat the butter and honey together until lightened and fluffy, about 2 minutes. Beat in the almond flour, coconut flour, vanilla extract, and salt until well combined. Stir in the chopped pecans. Make sure you use your sprouted pecans! Roll the dough into 1-inch balls and place a few inches apart on the prepared baking sheets. Flatten slightly with the palm of your hand. Bake 5 minutes then remove from the oven and use a flat-bottomed glass to flatten again to about ¼ inch thick. Return to the oven and bake another 10 to 12 minutes, until the edges are golden brown. Remove and let cool completely. Store on the counter for 4 days and in the refrigerator after that. Over a double boiler, in a glass bowl, combine the chopped chocolate and cocoa butter. Heat until smooth. Add honey and the peppermint extract. Line a pan with parchment and simply pour the chocolate in. Freeze before continuing to the next step. Over a double boiler, in a glass bowl, combine the cocoa butter and coconut oil. Heat until smooth. Whisk in the honey and peppermint extract until smooth. Gently pour over the chocolate then return to the freezer. Freeze about 10 to 20 minutes, until just starting to set, then sprinkle with crushed peppermint candies. Return to the freezer until completely set. Store in the refrigerator. Preheat oven to 325°F and line several large baking sheets with parchment paper. In a medium bowl, whisk together the almond flour, cocoa powder, spices, baking powder, and salt. In a large bowl, beat the butter with the honey until light and fluffy, about 2 minutes. Beat in the egg and vanilla until well combined. Beat in the almond flour mixture until dough comes together. Press the dough onto the sheet, cook for 12 minutes. Cut out gingerbread men and cooked them for 2-5 more minutes. Or, for a no fuss option, roll the dough into balls and cook them for 12-14 minutes. 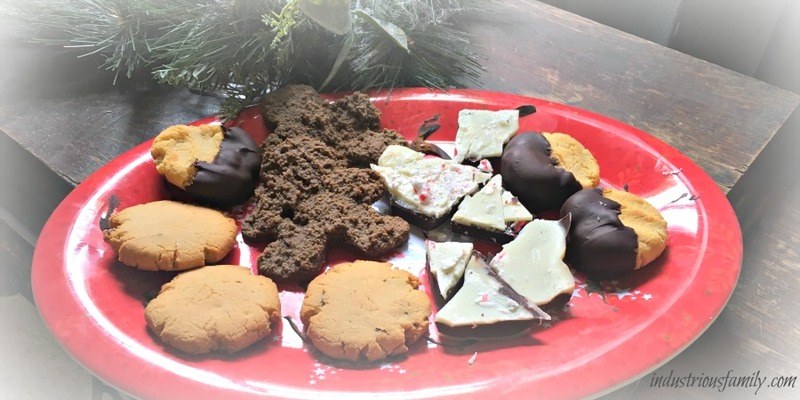 These cookies satisfied our Christmas cookie desires and wants. If things start to go a little weird, just keep going, anything with honey in it tastes great. The Orange Spritz and the Butter Pecan actually tasted like real cookies and not something using that name as a disguise. It takes more TLC to make gluten free Christmas cookies. Cook them low and slow. Merry Christmas!